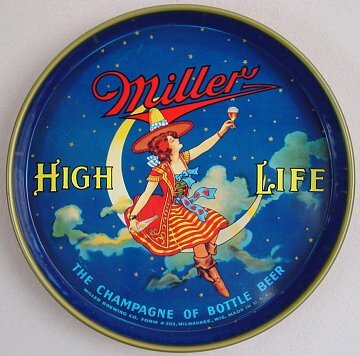 "The Champagne of Bottle Beer"
Milwaukee, Wisconsin Comments: Another very popular tray. Not quite as plentiful as the 1950's 13" version, but very easy to get. A nice upgrade now has my version of this great tray very minty. This tray also comes in a 13" version. It is not near as common as the 12" version. Ona a personal note "You were right Dave!" O.K., I said it for the world to hear and I will never doubt you again. What kind of beer do you want for winning the bet. 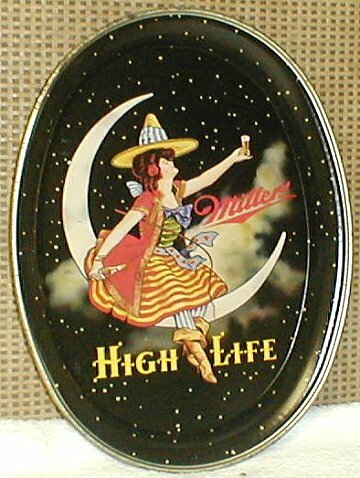 Miller High Life perhaps? Tray Trivia Answer: At last count, the Trayman was aware of 5 different versions of the Miller Lady on trays - see below. The 1930's version also graced their Charger from the same time frame. The 1940's version can be found in a 12" round and an oval version. Lately two new reincarnations of the Miller Lady surfaced. I believe you may be able to purchase them at Brewery Gift Stores. If anyone knows of more, please let me know. The long oval is not in my collection - this picture is from an eBay listing.